"The FINAL loungerific installment of The Salon's new swank event at the beautiful Edison Ballroom! We're featuring one of our favorite singers, Queen Esther (Jazzmobile Singer of the Year). It's the last chance of the season to put your finest threads on and get the best in lounge with an open bar & hors d'oeuvres all night! Open bar and hors d'oeuvres included! As we reported back in December, restaurateur and scene maker Elaine Kaufman passed away at age 81. Last week, the new owners decided to close the place permanently but not without a party fitting for Elaine. Loungerati's Eff, a regular, was able to get the last open reservation at Elaine's and reports from the inside of legendary New York restaurant on her final night. It’s been said “For the regulars, what Momma (Elaine Kaufman) created was more than a scene. 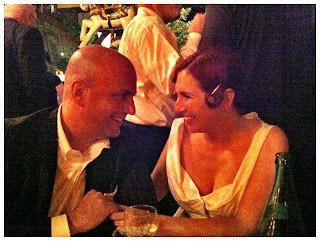 It was a family, a club without dues, a dinner party with a glittering guest list.” So, how to acknowledge the close of a nearly half century culture of friendship, celebrity, drinking and fine dining? It seems only proper to do so with a last call...at Elaine’s. Wouldn’t ya say? 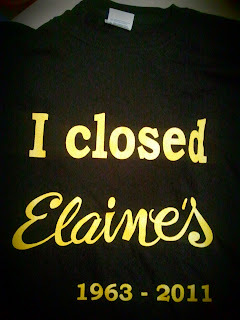 As if granted only one phone call, when I received word that Elaine’s would be closing this week, I knew precisely what to do. And with a call to Elaine’s new owner Diane Becker, I snagged the last available reservation for dinner, on the very LAST night at Elaine’s. Ms. Becker proposed the bar’s last call would be at 4AM. We hoped it would never end. Truth be told, I was granted three phone calls, not one. I knew how to use my next two: one was a call to work to take the subsequent Friday off. The third and final call was to Loungerati diehards Mr. Gotham and his missus, burlesque queen Grace Gotham, who first introduced my soon to be wife China Girl and me to Elaine Kaufman and her ‘home’ four years ago. The comely duo accepted my request for the honor of their company that night and off we went. As my wife and I approached 2nd Avenue on the warm May night, we were greeted with a mob-scene of paparazzi, media vans, and on-lookers outside. 200+ bystanders were congregated in front of the venerable restaurant: snapping pictures, catching glimpses of the jet setters, and trying unsuccessfully to sidestep security to get inside Elaine’s. It was nothing less than a heart pounding experience to bypass the insanity by whispering ‘the right word’ at the door and being invited inside. Once in, another level of scrutiny ensured folks were ‘in the right place’: if staff didn’t know you by face, you were escorted back outside regardless of reservation. It was easier to board an EL-AL flight. 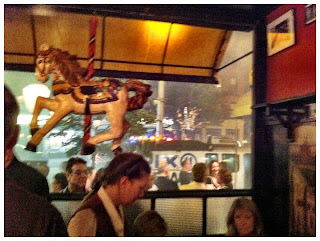 The Gothams were already seated at a primo four top by the front of the saloon. 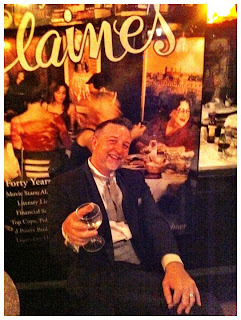 We squeezed through the crowd and joined them, quickly ordering a first round: champagne for the ladies, a Dewar’s on the rocks for Mr. Gotham and a single malt Rusty Nail - my signature kickoff beverage when at Elaine’s. Our appetizers included the delightful calamari, beef carpaccio, two dozen oysters on the half shell, and Elaine’s signature baked clams. Entrees included fettuccine with scallops, China Girl’s off-menu linguine a la vodka, linguine with clam sauce, chicken limon, and an order of Elaine’s heavenly cream tortellini to be enjoyed family-style. With full bellies, the clock striking Midnight, and the next day off, together we settled in for the long haul – the promised 4AM last call. Several bottles of Nicolas Feuillatte champagne later, it was Elaine’s as usual - which is another way of saying that anything could and would happen. 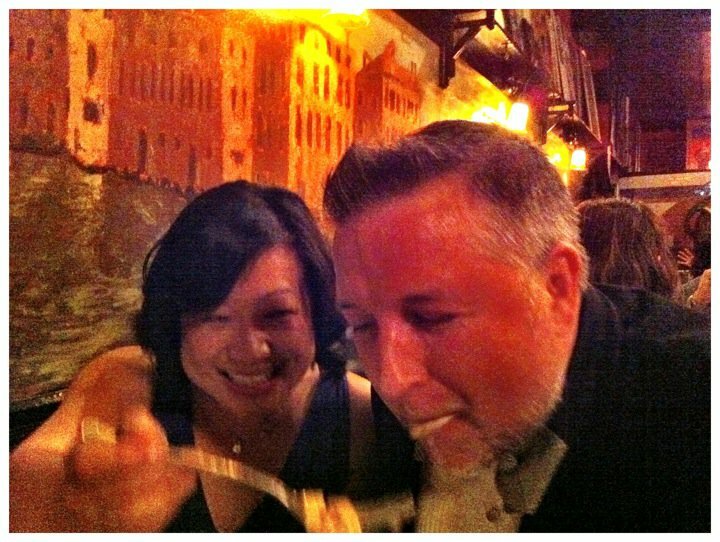 Our handsome friend Alec Baldwin made the rounds visiting tables. Dr. Ruth was schmoozing and reminiscing. Before too long, I was introduced to legendary writer Gay Talese and together we lamented the closing. Actor Chris Noth was hamming it up with China Girl, who proved herself more than capable of witty repartee. Former NYPD commish Billy Bratton and his wife Rikki Klieman were present. Speaking of Police, about two dozen officers were called to break up the ever-growing crowd, but not before someone lit a full-fledged smoke bomb to clear them first (we briefly thought the building was on fire- it was THAT smoky outside). Artist De La Vega appeared outside to chalked up the exterior glass with “They were all impressed with your Halston dress…” but not before getting caught in the act by my camera from inside Elaine’s. Speaking of artists/designers: Vivien Westwood, Brioni, Ralph Lauren Purple Label, Robin Rotenier, Tiffany and Co., Brooks Brothers, and yes, vintage Halston were all duly represented at our table. We were the Angolo do Modo! Desserts came around (oh Elaine’s pecan pie!) and a little caffeinating to further boost our spirits as we passed the 7 hour mark! In a fun Loungerati exchange, Elaine’s staff asked our table to sign a copy of their “Everyone Comes to Elaine’s” book, only to have us retaliate by pulling out a copy and having them sign ours! In another typically ‘untypical’ Elaine’s moment, a bartender, just past Midnight, stood up on this chair, cursed out the management, quit on the spot, and stormed out with his “I closed Elaine’s” tee shirts he generously had made with the intent of gifting to attendees (fear not, we caught up with him later and scored a few!). It goes without saying that there was mass chaos and confusion BEFORE this occurred. But imagine after wards – with the bar shutting down hours before the final celebration was over! In that defiant gesture by the bartender, came the final irony. Unknowingly, when attendees finished their drinks in hand which was rather early into the last evening of Elaine’s, they were through. For there was no last call at Elaine’s that night. It never happened, and (now) will never happen. Which I suspect, is precisely how ‘Momma’ would have wanted it. "It's a very special edition of Wit's End! 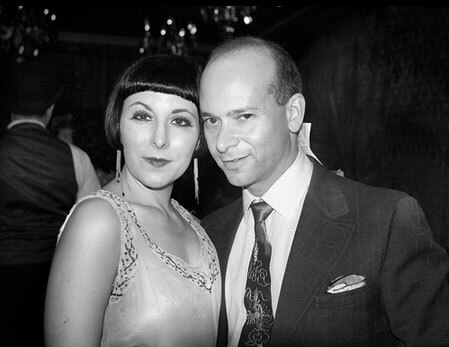 Not only is it the launch party for the fourth issue of Zelda : The Magazine of the Vintage Nouveau, but it's also the official CD Release party for Gelber & Manning's new album, Moonlight Picnic! Celebrate both with us over the holiday weekend! All guests will receive a copy of Issue 4 of Zelda, with lovely gift bags while they last! Arrive early to ensure that... you get yours! JUST ANNOUNCED : Our friends at Sweet Libertine Mineral Cosmetics will be providing eyeshadows for our gift bags! Make sure you're there early enough to get yours! GELBER & MANNING will be providing the hottest jazz and ragtime tunes you can handle as we foray towards summer! Get your copy of their new album tonight only for just $5 - that's half price! FREE DANCE LESSON with Jeri Lynn and Neal! RESERVE YOUR TABLE! Flute is now offering table reservations for our guests! 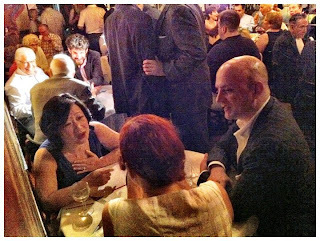 To reserve your table for Wit's End, call Flute Midtown at 212.265.5169 and mention our party. As always, vintage cocktails, music of the 1920s/30s, and good conversation! Evening attire is required; 1910s-1940s vintage or vintage-inspired is encouraged!" Sometimes there is a gem of a drink hidden in plain site. In my eyes, the Toronto Cocktail is a friggin' lost diamond! Rye. Fernet Branca. Sugar. Bitters. It does not get any more simple than that with cocktail ingredients. Some background: David Embury's presents this cocktail as a variation of the Old Fashioned in his The Fine Art of Mixing Drinks (1948). However, I prefer the Toronto served up with an orange peel. This libation unites two of my favorite spirits - rye whiskey and Fernet Branca into a well balanced and strong pick me up. Embury's recipe has Canadian whiskey which makes sense given that American Rye production had been decimated by Prohibition and well, the drink is named after Canada's largest metropolis. However, I recommend using a full bodied robust American Rye like Rittenhouse 100 Bonded Rye which will stand up to Fernet's bold medicinal flavor, but does not overwhelm the drink. In fact, I increased the proportion of Fernet to 1/2 oz to balance Rittenhouse's strength. Building the drink: Start with reliable Angostura bitters and simple syrup in a mixing glass, then add the liquor. Lower a few lumps of cracked ice into the glass and stir rigorously for 20 seconds. Once you strain into a chilled cocktail glass, hold a match under a freshly cut orange peel and ignite the oils over the drink. Combine ingredients in a mixing glass and add cracked ice. Stir mixture until ice cold and then strain into a chilled coupe. Garnish with burnt orange twist. Where to get it: Maison Premiere in Williamsburg, Brooklyn; it is not on their spirits menu but they roll one upon request. Variations: King Cole Cocktail (2 oz Bourbon, 1/2 oz Fernet Branca, 1/4 oz simple syrup, dash of Angostura, orange twist). THE SALON has teamed up with the beautiful 1930's EDISON BALLROOM to feature the best in lounge, with a spectacular lineup of live jazz and lounge bands, burlesque dancers, DJ's and craft cocktails. Plus, there is a top-shelf open bar and hors d'oeuvres all night; THE LOUNGE perfectly evokes the glamour of classic New York City. Known for throwing some of the best retro-inspired parties in New York City, THE SALON created this new swank event within the intimate setting of the upstairs lounge of the renovated 1930's Edison Ballroom. Featuring live music by MATTHEW PIAZZI & THE DEBONAIRS; GRACE GOTHAM - Humor's Favorite Temptress; MC DANDY WELLINGTON; Primativa in Hi-Fi The Exotic Sounds of DJs JACK FETTERMAN & GINA OF THE JUNGLE; and cocktails by FREDO of LOUNGERATI. 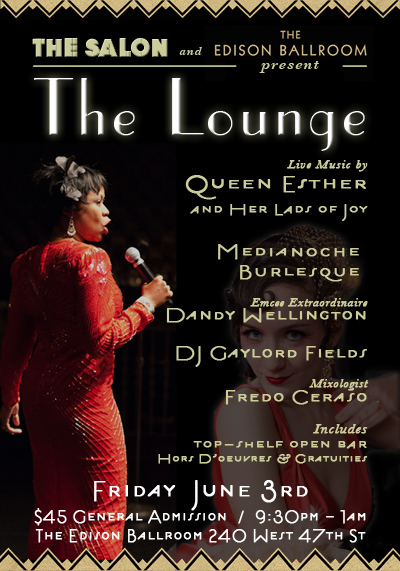 THE LOUNGE at THE EDISON BALLROOM, located at 240 west 47th Street (btw Broadway & 8th Ave) and starts at 9:30pm with live music until 1am. General Admission is $45 and includes top-shelf open bar all night, hors d'oeuvres, tips and coat check. Tickets can be purchased at the door. To say that we love that legendary horse race held the first Saturday in May at Churchill Downs is an understatement. The Kentucky Derby unites classic fashion style, 19th century cocktails, gambling, and an age old sport of kings in a quintessentially American event. 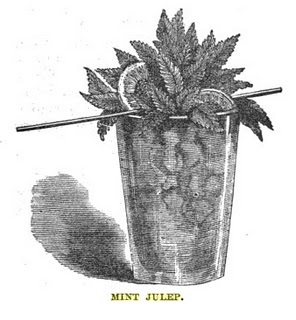 The fellows suited up in seersucker, ladies in elegant straw hats, bourbon mint juleps in icy tins, and 20:1 wagers on a horse named will be par for the course at the 137th running of the Derby. Naturally, the loungerati will be in full regalia, julep chalice in hand! Gently bruise 1 mint sprig using a muddler with syrup in a mixing glass. Add bourbon but do not mix. Strain into a frosted silver julep cup or highball glass over crushed ice. Then stir the mixture gently. Top off with more crushed ice and garnish with remaining mint sprig. Insert sterling silver straw. Combine alcohol in mixing glass, add ice, and stir for 20 seconds. Strain into an Old Fashioned glass over ice. Garnish with lemon twist. Combine ingredients in a champagne flute and top with chilled Champagne, stir lightly and garnish with orange twist. We will be catching the Kentucky Derby live at The Rum House (228 W47th Street) at the Edison Hotel off of Times Square in New York City. Race begins at 6:04pm sharp!